Tuna Salad-I hate it. Funny way to start a post about tuna salad, right? But I hate tuna salad. No, I’m not being dramatic. I hate it. Know who doesn’t hate it? My hubby, he loves it. In fact, it is one of his go-to meals when I’m out of town. Why when I’m gone? Because I hate it. I know we can’t possibly be the only couple that gets to enjoy one dish only when the other one is not around? My dish is risotto. I love it, hubby hates it. In fact, he won’t even look at it. So you see, that makes us even. Begin my dilemma of what to do. I put on my TO COOK IS TO CREATE thinking cap and did what I tell everyone to do when it comes to leftovers. Break down the leftover into basic ingredients. Tuna Salad=tuna, mayonnaise, celery, onions, and relish. I thought about adding mashed potatoes and making a dough, but thought I still could taste the fishy tuna. Then I thought about what makes everything taste better here in Louisiana–Fried Foods! Yes, I turned the leftover tuna salad into a plate of crispy fried fritters. I admit I was a bit hesitant the first time I took a bite, but one bite into the fritters reminded me so much of fried cod in fish and chips…which I love. We enjoy (yes, no longer hate seeing leftover tuna salad in the fridge) these fritters with a dip similar to a Tzatziki style dip minus the cucumbers. I like to use pickle or jalapeno juice to really add spice or zing to the fritter batter, but if not water works fine, too. In a large bowl, combine flour, egg, onions, parsley, and pepper. Gently fold in tuna salad. Add enough water, pickle or jalapeno juice to create a thick batter. Put mixture into refrigerator and let stand for 10 minutes. Heat oil in a heavy pot or deep fryer to 350* Using a cookie scoop, drop fritter batter into hot oil. Fry until golden brown. Remove with slotted spoon, sprinkle with Cajun seasoning, and let drain on paper towels. Combine all ingredients and serve with fritters along with lemon wedges, if desired. No tuna salad to see or smell here! Put On Your TO COOK IS TO CREATE Thinking Cap: Think about what is already in your tuna salad and adjust seasonings accordingly. Not an onion fan? Use minced bell peppers, celery, or even carrots. Caper fan? Add some. 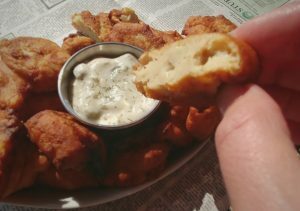 These fritters also go well with cocktail, remoulade, or tartar sauce or keep it simple with ketchup. Think about how simple herb substitutions like oregano, thyme, or could change the sauce. If you are a cilantro lover, I recommend substituting it along with lime juice for lemon. Like a traditional Tzatziki dip? Add in some diced cucumbers and even some feta cheese for even extra flavor. No tuna salad? Give chicken or egg salad a go. I can’t wait to try my Crunchy Leftover Jambalaya Salad. FOOD FUN: According to Smithsonian Magazine, tuna salad sandwiches came about when “office lunch hour had time limits. So lunch counters came up with the idea of offering the salads between two pieces of bread, which sped up table turnover and encouraged patrons to get lunch to go.” I definitely don’t want to grab a tuna salad sandwich to go, but I will grab a few fritters. Glad you’ll be joining me on the tuna salad fritter kick. I could not imagine my brother eating tuna salad til I saw there were no eggs in it! We love tuna salad sandwiches-WITH eggs! Yes, you knew it. Can sneak in some eggs in some recipes, but shhhhh. Don’t tell. Hope you’ll like the fried tuna salad fritters. Definitely stealing this! We both love tuna salad. Sally Tuna Melts, me even just on a piece of toast. But Fritters from the leftovers takes it to a whole new level! I often put red bell peppers with celery in Tuna Salad, Sally’s not fond of onion. If I make TS for me, I put diced green chilies in it or dill pickle relish (not sweet pickle relish). Try homemade Remoulade (or even the store-bought stuff) for a dipping sauce!! Happy for you to steal away and put your own culinary creative spin on it…then let me know, so I can steal yours.